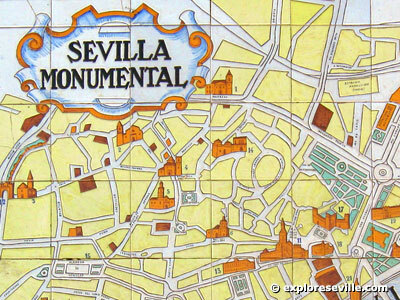 A map of Seville is always handy. Many of you have requested them and finally I've found a few good ones to post. 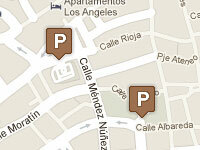 I've recently added some of my own Seville maps which are the first ones below. Aside from Seville I've included a few other cities and towns which are popular travel destinations on your way here. For now they are posted in PDF format, so if for some reason you don't have Adobe Acrobat then you can download it here. I'll be the first to tell you that these maps aren't very interactive, and there are some really nice alternatives if you're looking for a specific address. 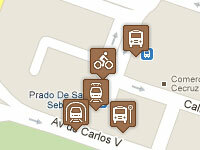 My favorite is the sevilla5.com - which is really an adapted google map. But there are listings of monuments, hotels, hostals, apartments and public parking garages with prices (and even photos so you recognize them). 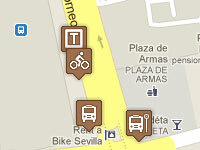 I am working on a fairly big map project so you can find just about everything in Seville. Below is a sneak preivew with some helpful maps for Seville at the top, plus the official tourism brochure which should help you with sights, monuments history and more. I recommend this map because it contains all of the monuments and covers all of the city center plus Triana and Los Remedios. This is part of the larger tourist brochure which can be found below. Thanks for Paul who pieced together this map from the many mini maps of Tussam. Here you will find all of the bus routes and stops in the center as well as outlying neighborhoods. Older map which is broken into quadrants, and thus the names above to indicate which neighborhood they cover. If you want to find all of the smaller towns and where they lie in relation to the city, then this province of Seville map is a good starting point. Good for finding the entrance and ring (loop) roads in and around Seville. This gives you a general idea of how to get into and out of Seville depending on your destination or where you are coming from. The whole tourist offering for Seville with history, walking routes and monuments. A few of the maps above come courtesy of this brochure. I choose to split them up in case you wanted everything or just the useful maps. 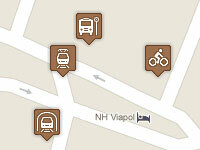 Qdq.com: navigate as if you were walking down the street itself. Enter an address and then see photos of the location.